If you planned on entering the Silver Necklace Giveaway, make sure you enter today. The contest ends at midnight tonight! We’re celebrating 150 fans on our Facebook page – which means a new custom necklace for one of you! You’ll get one hand stamped sterling silver necklace with whatever you’d like stamped on it (well, ok, whatever will fit, anyway). You can also add a pearl or a birthstone if you’d like – it’s all up to you! The disc is 3/4 inch across – the most common size of the necklaces here – and you get your choice of an 18 inch thin curb chain or delicate ball chain. To enter, you need to like the page. Then just leave your name and email address. We’ll email you if you win. Giveaway closes at midnight on August 8, 2011, and the winner will be announced the morning of August 9, 2011. Be sure to tell your friends! If you’re interested, you can enter the giveaway over at the Hope of My Heart Designs Facebook page. My desk has been piled high with bracelets ready to package and ship, but it’s been fun. I’d never used Paypal’s Multi-order shipping before yesterday, but I am thankful for it. It makes things a lot easier than doing it individually, that’s for sure. These bracelets are just about done – they’re just waiting to be shaped. I’ll probably find a movie on Netflix or something to watch while I work on them. 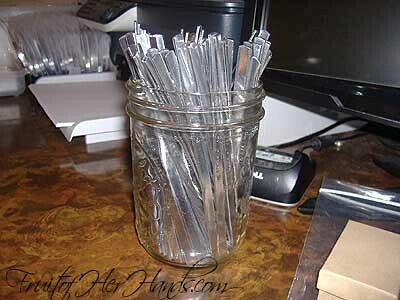 There are actually several jars on my desk, with bracelets in varying stages of completion. It’s been kind of crazy around here, but that’s ok. The craziness will be over soon enough. . .and then we can relax. . .
650 bracelets. Unbelievable. That is far higher than I ever imagined! Believe it or not, I’m not overwhelmed at the number of bracelets to make. I’ve been working steadily on it and they’re coming along nicely. 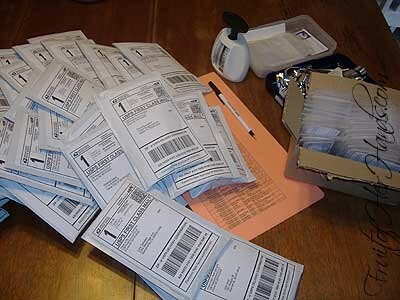 There are almost 200 done on my desk, and the supplies to make the next 500 are on the way here. So that is going well. What I am overwhelmed about is God’s goodness. I prayed He would let the deal do well, but only prayed that He would let the minimum amount sell. . .I didn’t know what I could handle so just left it in His hands for the final number. Tuesday and Wednesday were crazy, watching the numbers go higher and higher. I probably refreshed the page a thousand times just watching it. 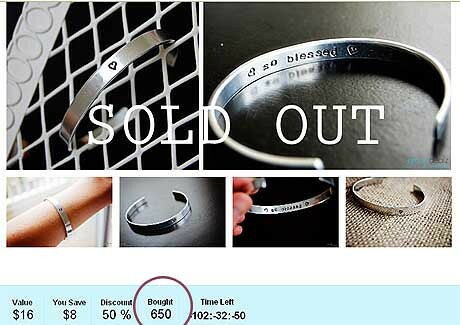 It is such an honor and an amazing blessing to see how these sold. I can’t say “I sold. . .” because I didn’t. God did. So today, I am absolutely overwhelmed at God’s goodness. I’ve been praying about how to grow my jewelry business but haven’t been 100% sure how to go about it. I’ve been doing LOTS of reading and researching. But this was wonderful. Have you ever heard of Groopdealz.com? 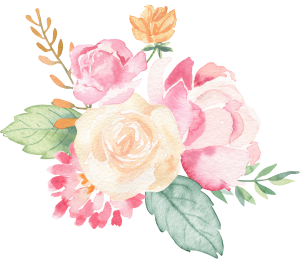 They are a daily deals site that specializes in boutique and handmade items. They have had some of the neatest items – from wall signs and decals to handmade jewelry, to lace tights for little girls. . . and today they’re featuring my jewelry. The neat thing about Groopdealz.com is the way they have things set up. They use the concept of bulk buying so the customer can get a better deal. By selling at higher quantities, the sellers can then buy the supplies in bulk and also sell more than they might have been able to otherwise. It’s a win-win situation for both buyer and seller. They’ve been great to work with, and I’ve been really excited about it. If you haven’t seen their site before, take a look! This morning I was working on some business things, and entering orders and other similar info into my tax document. It absolutely amazes me how busy I’ve been with jewelry lately – and just how much God is blessing my business. It has been so much fun though, and I really do love it. 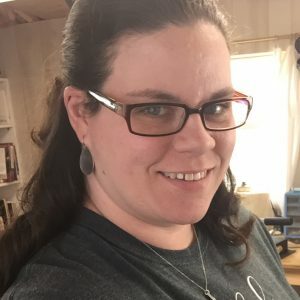 That’s one reason my blog has been a bit quiet lately – a lot of my time has been devoted to jewelry making – and I don’t want to overwhelm this blog with posts about jewelry too often. I’m thankful. God has been so good and has really been growing my business. I also have a huge project in the works and hope to be sharing more about that next week when it goes live. After next week, a friend and I are hoping to share a booth at a craft festival. There’s one we’re thinking of, but we’ll see how that it works out whether or not we apply for it. It seems like most of the spring festivals/fairs/craft shows are in April and May, but I’m playing for a choir concert May 12th and want to do something later than that. There are so many events around here – it’s just a matter of finding one that’s not too far or has too high of an entrance fee. Exciting stuff! It’s keeping me busy but I’m thankful for it! These past few weeks I’ve been busy with jewelry. Until just recently, most of my sales have been from my online shop. And that’s great! Now there is a possibility I’ll be able to put some of my jewelry in a local antique and gift shop as well, and I’m waiting to hear back about it. I’ve also been listing some of the new pieces online until I do hear back from them. Here are a few of the new designs. You can click on any of the pictures to read more about it in the shop. 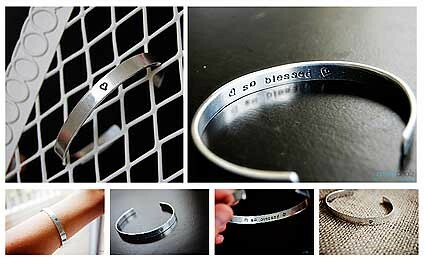 Hannah’s Prayer Infertility Bracelet – I love this bracelet. It sparkles so much, and catches light from across the room. But the hand stamping. . .that is what has been the most addictive. There are SO many ideas and so many ways to stamp them that I’m only limited by the supplies in stock here to play around with. I LOVE it. I love the So Blessed necklace and would love to keep it, but I didn’t make it for me. It’s in the shop though! Here’s my own necklace. I started with the Cherish necklace (that’s mine in the picture, which I made quite a while ago) and added a copper and a brass disc with our names on them. I’ve also been very busy with the business end of things. There is so much to read out there about building a business, and I’ve learned a LOT lately. I’ve made some new goals, redone the website a little bit (rearranged categories, added a LOT of new pictures, etc. ), and am hoping to really grow the business this year. Back in November, I switched credit card processing companies so that I could accept credit cards at craft fairs and home parties. That also made for some changes to my website since I had been using Paypal. Then I learned that my site has to be PCI compliant – an extra level of testing to ensure that customer data is secure. The Hope of My Heart site has been secure all along, but now I’ll have extra certification to prove it. I’m not excited about the process but am looking forward to holding that certification. It has been a lot of work. But the jewelry-making part of it has been so much fun! At the request of someone on Facebook, I made some snowman earrings today. They’re so fun! These are for a craft event this weekend, but I’m considering making myself a pair. I can’t decide which ones are my favorite. I like different things about each set. Which is your favorite? Several people have asked how the craft fair went. It was a learning experience, to say the least. The short answer is it didn’t go as well as I’d hoped. Most of it seems to be because it was the first year for the event, and even though it was promoted, not many people seemed to know it was being held. 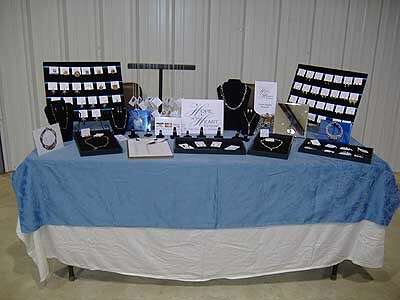 There were a couple other vendors there who do craft shows on a regular basis. It was interesting to talk with them and learn some things. I was hoping it would go better than it did. On the other hand, I got some really good feedback about the jewelry and got a better idea of what people like. Not only that, but now I have a TON of jewelry made up and new designs to put in the shop. 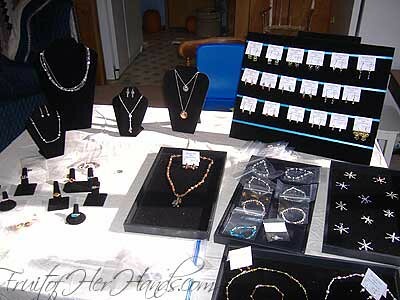 One thing I hope to be doing now is jewelry parties. Jewelry is made up for it, and everything is ready to process custom orders (including a new credit card processing company, which is great). Stephen and I also talked about putting the jewelry in local stores. This was our plan before the show – that if there was a lot of jewelry left over we’d pursue home parties and maybe a local store or two. So onward I go. Lord willing, I’ll be able to schedule some jewelry parties in the very near future! The craft fair is in two days. I’ve been working frantically, trying to get as much jewelry made as possible. It’s been a challenge to work it around normal parts of our day (like schooling), but things are still coming together nicely. It makes me really thankful Samuel has his own desk for school – it is less of a worry to leave enough space for him at the table when jewelry supplies are spread out everywhere. I also had pictures of a few custom designs printed up for display too. 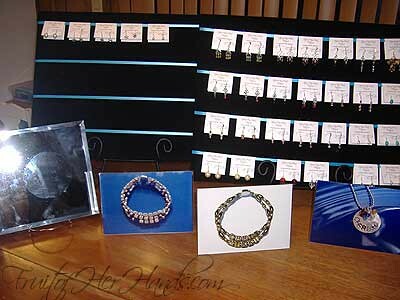 The majority of my jewelry is made to order, and I wanted a way to represent that at the fair. The pictures turned out better than I expected, so that was really nice. Now, just to get everything finished between now and then. . .